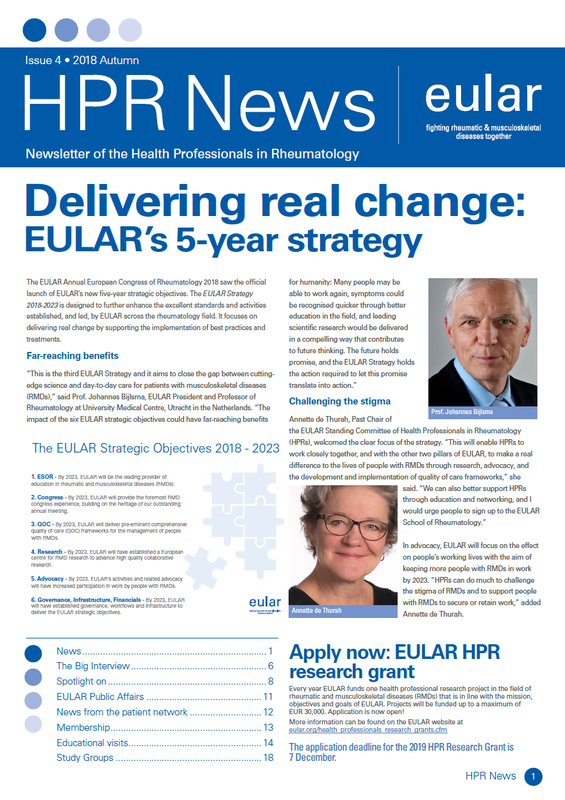 Since 2000, the HPR newsletter has functioned as the main information channel of the Health Professionals in Rheumatology (HPR) within EULAR. The newsletter is published twice a year featuring the work of HPR and all aspects of multidisciplinary collaboration in rheumatology. Update: January 2019 - get the most out of the HPR newsletter! Page 5: Working towards greater collaboration Find out EULAR Vice President representing Health Professionals in Rheumatology, Tanja Stamm’s, thoughts on how collaboration can help achieve EULAR’s strategic goal of implementing high quality care.